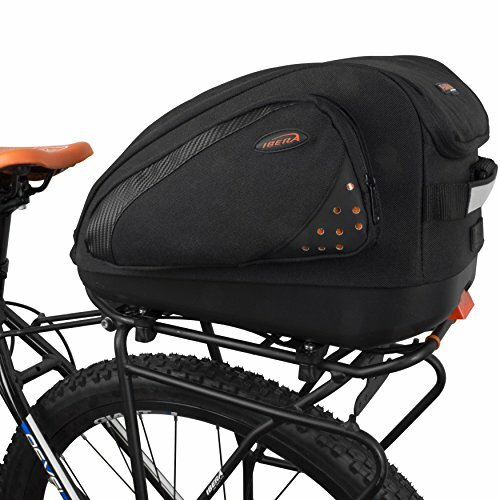 This Award Winning Taipei Cycle Clip-on System Carrier has all of the advantages of a PakRak clip-on bag while utilizing your existing carrier. The carrier bag will fit most bicycle carrier racks (adaptor bracket and parts included), including seat post-mounted and frame-mounted racks. Trunk bag is top-mounted, and useful for weekend bike outings and commuting to work or school. Supplied with carrier interface adaptor, bag carries a laptop (13 in), school books, groceries, a change of clothes, bike gear, and other small items. Features: Clip-on Quick-Release System, Multi-Compartments, Hard Base, Reinforced, and Padded Body, Large Compartment with Inner Mesh Pocket, 2 Side Pockets, Hand-carrying Strap, Detachable Shoulder Strap, Reflective Trim, Taillight Hanger. Specifications: Material: Polypropylene Base and 600D Nylon. Mount: Quick-Release Clip-on System. Carrier Attachment: PakRak Button Lock Mechanism/Carrier Interface Adapter. Carrier/Rack Compatibility: Supplied carrier interface adapter can be attached to most seat post-mounted and frame-mounted carriers with a top frame width of 3.9 in.-5.9in. (100-150 mm), and a rod diameter of 0.4in.-0.5in. (9-12.7 mm). Capacity: 15 L. Weight: 1.7 lbs (750 g) Dimensions: 14.5 in x 3-9.75 in x 8.7 in (37 cm x 7.6-24.8 cm x 22 cm) - Angled Height Carrier Bag. Item No. : IB-BA18.